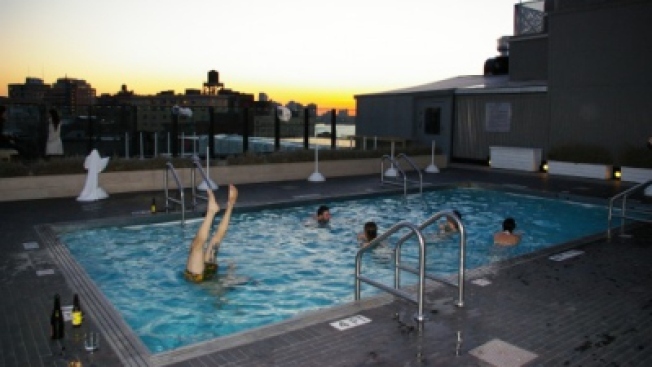 Members of the Spotted Pig staff take a dip in the roof-top pool at SoHo House. 1) First and foremost: Ken Friedman was rooting for the Cardinals, because "the quarterback is old like me." 2) Some brave Spotted Pig staff did in fact take a dip in the heated rooftop swimming pool to show off their waterobics skills. After admiring the sunset, they returned to their suites to prep for the evening's festivities. 3) In one suite, the egg-shaped bathtub was stocked with an assortment of liquors, prosecco, and Pacifico. More than one round of tequila shots was had before 6:00. 4) The main event, held in the Library, was Neil Ferguson's food: trays of scallops with sunchoke, pork belly with pureed apple, steak with pumpkin puree and parmesan, cheese puffs and sliders of every variety - pork, duck, and beef - made the rounds. By the second half, the fare got more conventional, with trays of mac & cheese, chicken fingers, and fish and chips. Later, cookies and brownies, flourless chocolate cake, lemon cake, and a cheesecake graced the buffet table. 5) When asked how he felt about the John Dory staff being there this year and if there was any sort of rivalry, one Spotted Pig staffer said ambivalently, "Well, it doesn't bother me..." Friedman tells us he had invited only certain JD staff who had worked at the Pig. For their part, the John Dory people stuck to their own corner all night. 6) Most of the female chefs, looking ravishing, made an entrance at 8:25 and were welcomed with a round of applause. The star chef April Bloomfield appeared shortly after in a t-shirt and jeans. 7) The first glass broke at 9:31. Immediately thereafter, a dance party broke out. 8) Afterparty location was, natch, The Rusty Knot.